I’ve had this lovely fabric earmarked for trousers for ages, and I dug out an old pattern to make ’em happen. 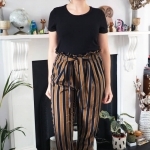 They are Burda 7017, which are amongst some of the earliest trouser projects I ever tackled a few years ago, and now unfortunately seems to be out of print. I wouldn’t exactly say it’s embarrassing to look back at those earlier garments, but it was nice to revisit this pattern with all I’ve learned about fit, technique and fabric choices since then and see the improvements. Having said that though, I averted a near-disaster on this pair when, after executing a lovely fly front completely from memory, I sewed up the side seams and found that I could barely squeeze myself into them. I don’t think I’ve gained a great deal of weight in the intervening years but perhaps I previously traced the pattern with extra safety seam allowance that never made it back to the paper pattern. Whoops. 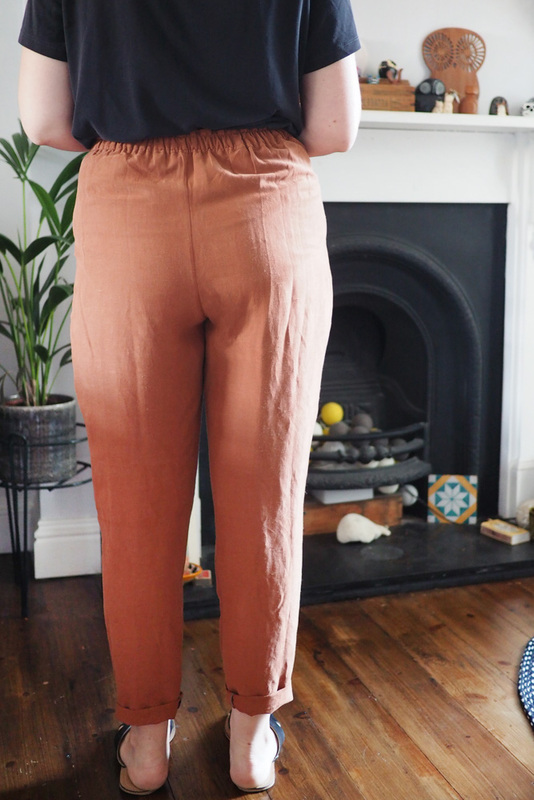 After sulking for a bit I unpicked and re-sewed every single seam – inner and outer leg, the centre back and centre front below the fly – with a tiny little seam allowance, basically right next to the overlocked edge. That provided just enough extra room to allow them to fit, albeit a little slimmer than I was shooting for. I still don’t think I’ll feel too confident cycling in them in case it puts too much strain on those tiny seam allowances and they split open, but at least they feel comfortable and I can move in them. 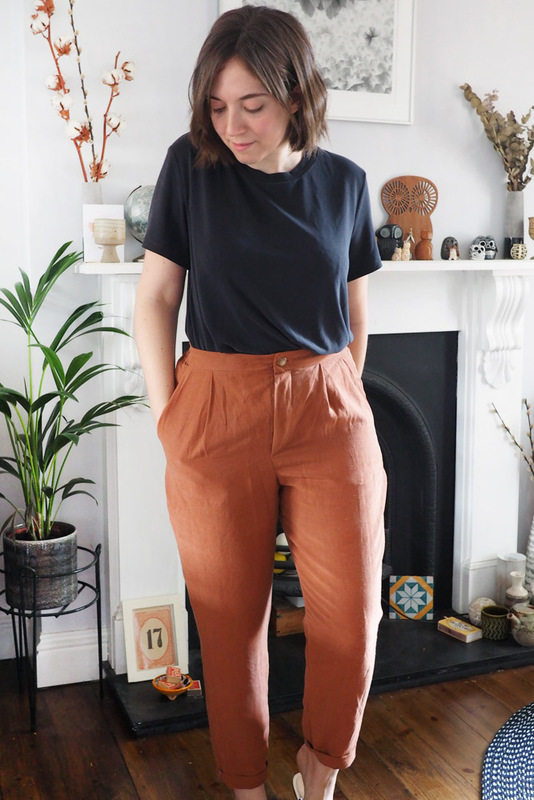 I think the fabric makes this pair quite special and is the main reason why I was so relieved to save the fit: it’s a cupro-silk from the famous stall outside Sainsbury’s in Walthamstow market. I bought it over a year ago on a shopping trip with some other sewers; Marilla made up her Bennett dress pattern in it. 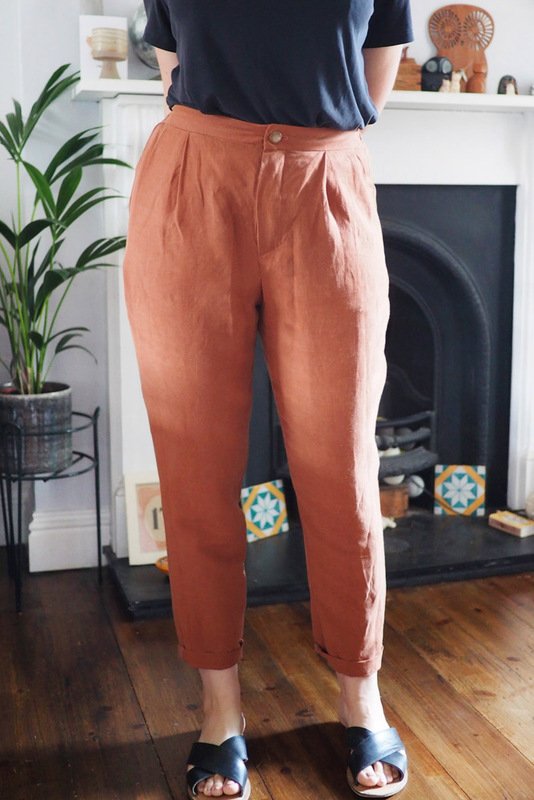 I’m not sure if ‘cupro silk’ means that it’s a fibre blend or a cupro designed to look like silk, but it’s the most beautiful terracotta colour with a sort of dimensional shimmer and a slightly slubby texture, feels deliciously cool and floppy to wear, and was a dream to work with. I don’t think I’ll find fabric of this nature easily again unfortunately though I’ll definitely be keeping an eye out. 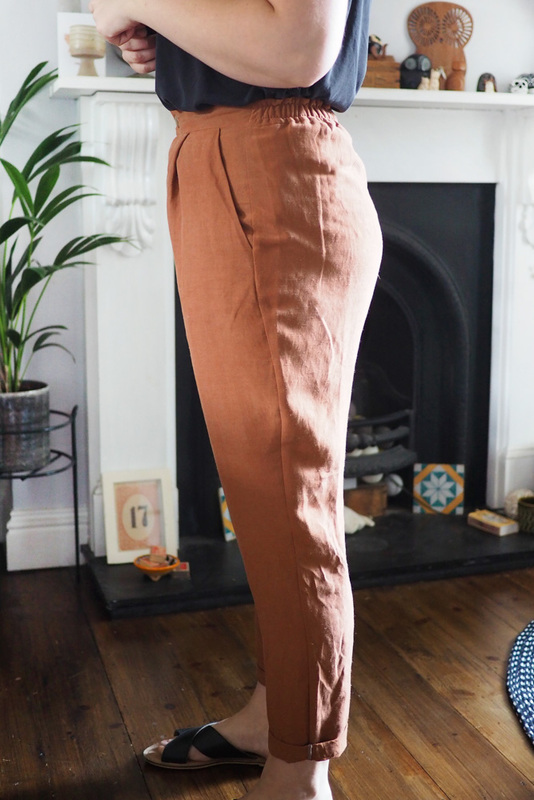 I tried out a little tweak I wanted to test based on some ready-to-wear trousers that I love of inserting elastic into the back waistband to maintain a snug, flexible fit at the waistline. 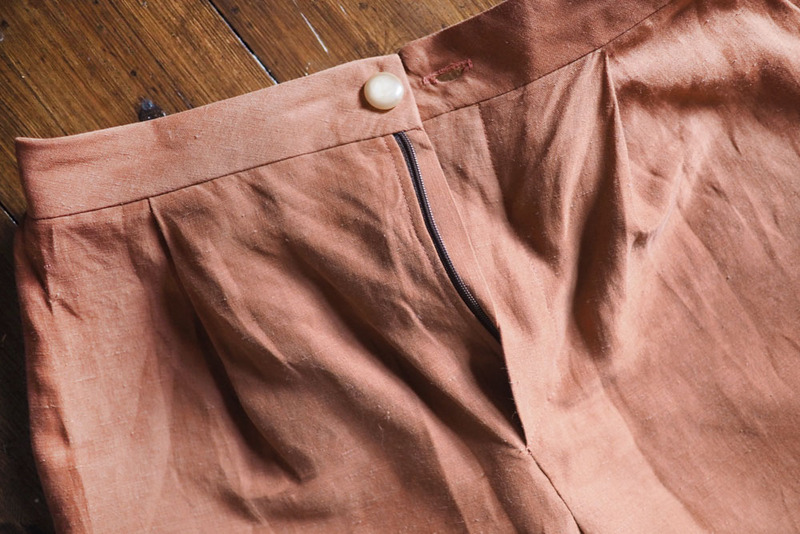 To do this I eliminated the darts from the pants back and added their takeup to the length of the waistband, then stitched in some 1″ non-roll elastic before sealing up the inner waistband. 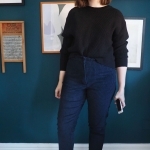 It worked out great so I’m going to retrospectively add elastic to my old black cotton 7017s that have stretched out and become too baggy at the waist, which will help ping them back to life. Oh that is one of my favourite colours at the moment. 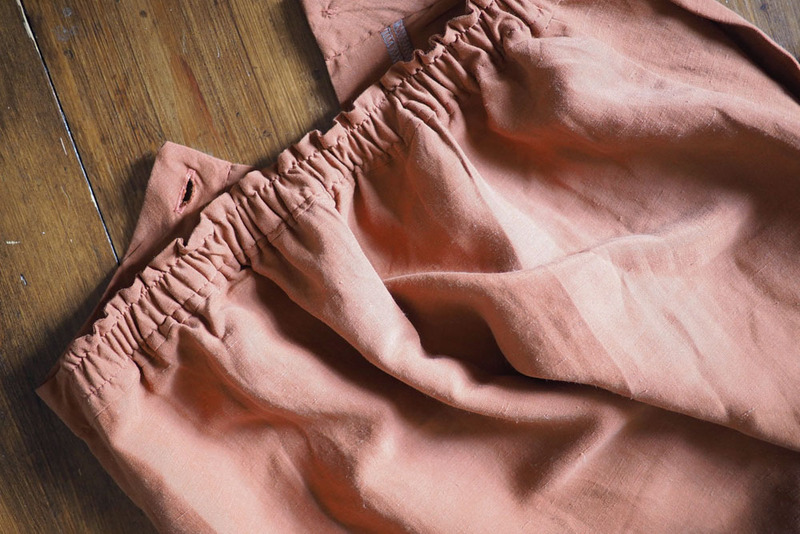 Good save – I did the same on some shorts last summer and proved one can insert an invisible zip with a 2/8 inch seam allowance if one is determined! That color is fantastic! Glad you were able to save them! I’ve done similar with elastic in the back waist to snug up waistbands. It’s saved several pairs of trousers for me! 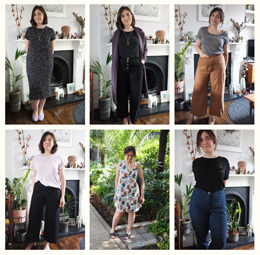 I’m so excited to fix a load of skirts and trousers – I think I’ll do it habitually going forward! I love these! Great save with the tiny seams. 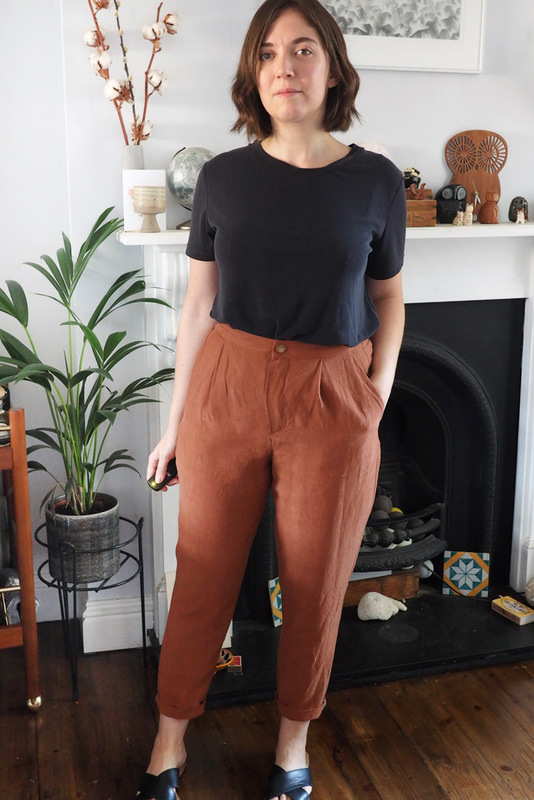 I cut out a stoo small pair of pants/trousers earlier in the summer but my accident is destined for refashioning (probably with added side panels, that’s how badly I erred). The fabric is very nice in color and fabric. 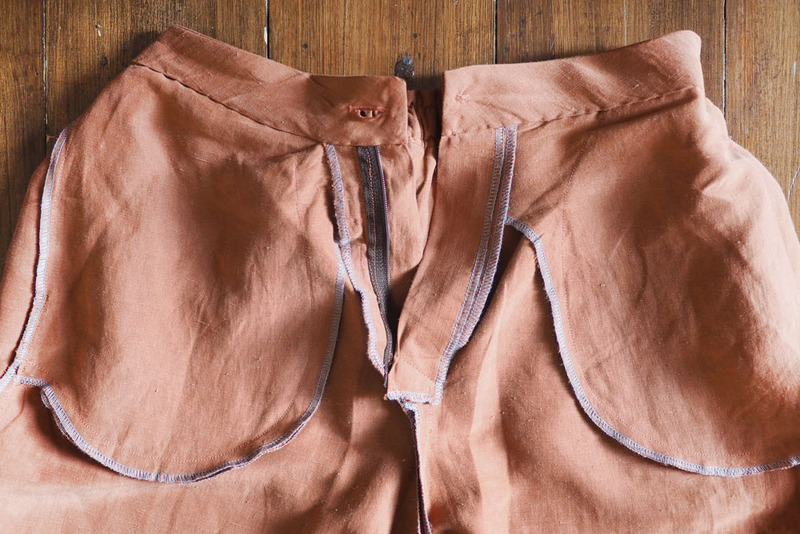 Like the way you saved the pants by letting out the seams. That was great determination. Learned from your explanations. This fabric looks and sounds exactly like the fabric I bought from TMOS a few months ago. I was there yesterday again and he still has it in the terracotta colour plus navy and olive green. I’ve seen those there – I think they are straight-up tencel, they don’t quite have the same slubby/shimmery loveliness, but i might have to try them sometime. I love that colour, it looks amazing as trousers! Thank you for the inspiration, I’m really tempted to make a pair. Well I can guarantee you won’t find this *exact* fabric again because I bought the end of the bolt two weeks ago! I recognized the fabric right away, partly because I took it out and and pet it almost daily until I sewed it up, and partly because I’m wearing my culottes in it right now! I’m just absolutely tickled. This is like a pleated-front trousers Parent Trap. Ah, that’s so funny! I’m glad it went to a good home and found its way into more cool trousers! Great color, Katie. It will go with so many shades. Opens up many possibilities.